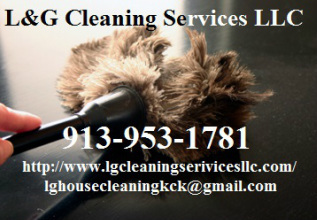 L&G Cleaning Services LLC - Home house cleaning, maid services, cleaning services, house cleaning in kansas city. Needing help cleaning your House or office?? Give us a call today. We take time to provide excellent cleaning Services so you can feel the nice Fresh Aroma of having your house or office clean. We like to make sure that you are satisfy with our work we provide to you. Try Our Cleaning Services ones and we ensured you that you are going to want us come back. About Us: L&G is local family own by two hardworking mothers that will help you with your Cleaning needs; So you can have more free time with your family. We take pride in our work. We ensure you that you will satisfy with our work. We currently providing services for Residential clients and Small commercial company. Discounts- 10% off on your first service by becoming a recurring client. Seniors get 10% off as well. Find Us-Facebook or Follow us on-twitter. Current Serving From Liberty MO To Johnson County KS. house cleaning, maid services, cleaning services, house cleaning in kansas city.